A unique, ready-to-use collection of 1559 marketed drugs for high throughput screening (HTS) and high content screening (HCS). • Science . 2014 Oct 3;346(6205):1255784. • Cell . 2018 Aug 9;174(4):843-855.e19. • A unique collection of 1559 marketed drugs for high throughput screening (HTS) and high content screening (HCS). • Used in the research of oncology, cardiology, anti-inflammatory, immunology, dermatology, endocrinology, neurology, and more. • A useful tool for researching new targets of marketed old drugs. • All compounds have been approved by the FDA or EMA. • Easily peelable foil seal makes the screening process easier and faster. • Lower price, more compounds. • Avoid multiple and uneven dispensing. • Reduce risks of product cross-contamination. • Avoid reduced activity due to long-term storage. 1 Can we centrifuge the whole rack? Yes. It is advised to centrifuge all of the samples before experimental use. Recommended centrifugation for this plate is 1000g or less. 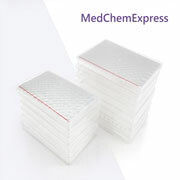 2 How can I use the 2D barcode on the microplate lid? Use an HD barcode scanner to scan the barcode, and then find the corresponding plate and compound information in the Excel or the provided hard copy. 3 What are the appropriate compound storage conditions? For solutions, store at -80°C. For some special compounds, specific handling instructions are provided. 4 After receiving the compound library, the ice box has melted, will this affect the efficacy of thecompound? MCE products are primarily chemical synthesis products which are not temperature sensitive. The ice boxes inside of the packages are used to prevent the occurrence of extreme temperatures during the process of transportation, and a melted icebox will not affect the reagent quality. After transit, the icebox is no longer needed.